A blasting operation at Pattison Sand Co.'s surface mine near Clayton, Iowa, is seen on Sept. 14, 2015, from across the Mississippi River in Bagley, Wisconsin. Homeowners Jim and Kathy Kachel say dust from the mine has gotten inside of their home. 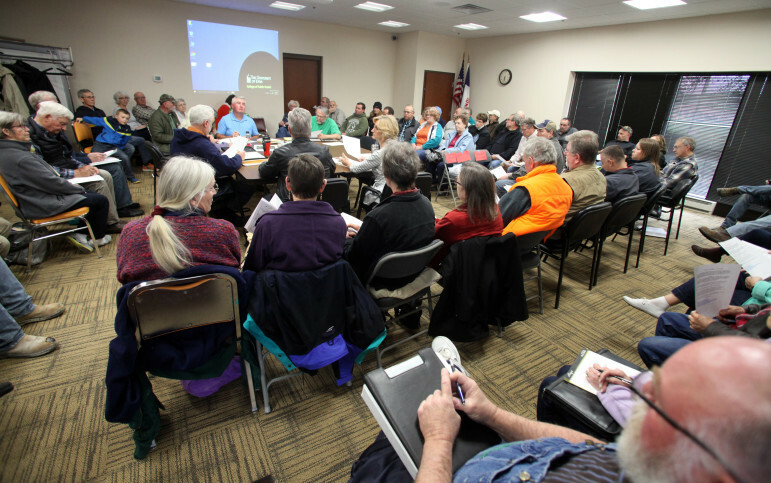 The Mine Reserve Expansion Study Committee meets in the Clayton County office building in Elkader, Iowa, on April 28, 2016. The committee was formed to determine the environmental, economic and aesthetic impacts of Pattison Sand’s proposed mine expansion. More than 60 people attended the meeting, where two experts on air quality from the University of Iowa spoke. A controversial frac sand mining company that recently opened a site in Wisconsin is facing opposition to plans that would greatly expand its mine in Clayton County, Iowa. Pattison Sand Co. has requested re-zoning of 746 acres of land from agricultural to heavy industrial to expand its underground mine. The site, which includes about 1,600 acres of surface area and 100 acres of underground mine, lies along the Mississippi River directly across from Bagley, Wisconsin. Many of its roughly 150 employees live in southwestern Wisconsin. 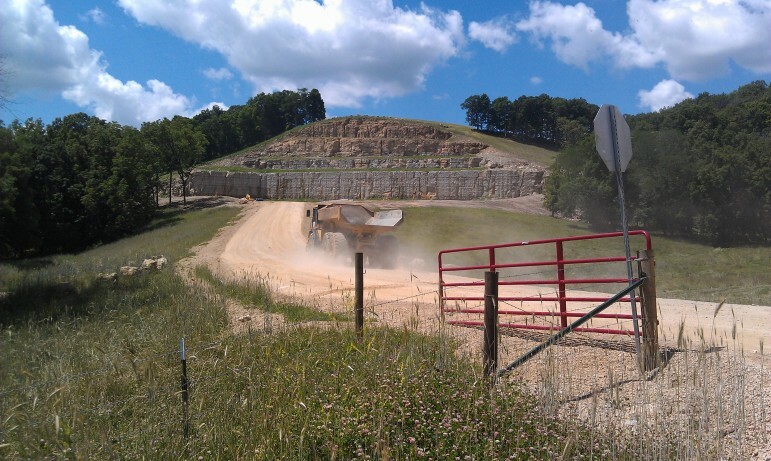 Since Pattison Sand’s Clayton County site began operations in 2005, it has racked up more workplace violations than any other industrial sand mine in the United States, according to data from the Mine Safety and Health Administration (MSHA) analyzed by the Wisconsin Center for Investigative Journalism. Among the violations is a 2008 accident in which a front-end loader that had a broken rear-view mirror with a bent mounting bracket backed over a worker, killing her. Patrick O’Shaughnessy, a professor of occupational and environmental health in the University of Iowa College of Engineering, speaks at a public meeting of the Mine Reserve Expansion Study Committee. O’Shaughnessy says although the risk to nearby residents from silica is small, a mine’s overall record should also be considered. 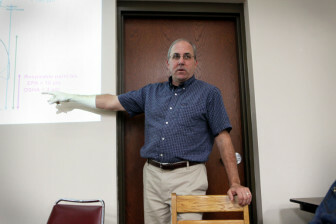 Patrick O’Shaughnessy, a professor of occupational and environmental health in the University of Iowa engineering college, told members of a county committee studying expansion on April 28 that it would be wise to review the mine’s record and reputation when considering the proposal. 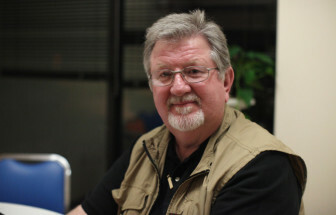 Nevertheless, O’Shaughnessy told members of the Mine Reserve Expansion Study Committee that residents living around the proposed expansion face a low risk of inhaling airborne silica particles from the mine. Inhaling silica can cause silicosis, an irreversible and sometimes-fatal lung disease, and can lead to cancer and tuberculosis. According to the Center’s analysis, between April 2005 and January of this year, Pattison Sand’s site in Clayton County had 934 MSHA violations for which the company paid $279,000 in fines. Wedron Silica Co. in Illinois — the industrial sand mine with the second most violations in that time period — received 501 violations. A truck enters a rural spot near Clayton, Iowa, on June 24, 2014, where Pattison Sand Company was preparing to open a new mine in the side of a hill. According to the data, little has changed since a 2013 Wall Street Journal analysis found that mining safety officials had cited Pattison Sand more than any other sand or gravel mine in the country. Among the violations identified by the Center, 235 were racked up since January 2013. In addition, the Center found that 55 Pattison Sand employees have filed workers’ compensation claims for injuries sustained at the Iowa location between 2005 and January of this year. Claims include fractures, dislocations, sprains, hernias and heat prostration. Two of the claims were filed for respiratory problems. In an interview, Christopher Hensler, district manager for MSHA’s north central district, said the regulatory agency’s inspectors have spent a lot of time at Pattison Sand’s Iowa site, but the sheer number of violations does not necessarily indicate a larger problem. “The bulk of their violations are very simple electrical violations and defects of equipment that affect safety,” he said. From left, Kyle Pattison, managing partner; Angela Sessions, public relations; John Hendrix, environmental compliance manager; and Tim Adkins, health and safety director, from Pattison Sand Mine at a meeting of the Mine Reserve Expansion Study Committee in Clayton Co., Iowa on April 28, 2016. One 2008 violation involving defects of equipment, however, resulted in a fatality. In that incident, a front-end loader backed up, striking and killing a worker. MSHA’s investigation report found the equipment had a broken rear-view mirror with a bent mounting bracket and that there was no visible reflective material on the employee. Pattison Sand was fined $70,000 for that violation. A 2014 fire and multiple roof collapses in 2011 also generated violations that resulted in temporary shutdowns. The collapses and an ensuing legal battle shuttered the mine for several months. Other infractions at Pattison Sand’s Iowa site include exposing workers to harmful airborne contaminants, failing to have protective equipment and clothing, and neglecting to provide at least two escapeways to the surface in the mine. At Pattison Sand Co., seen here in 2011, fine-grained silica sand is funneled onto conveyor belts that move it through a giant, hissing rotary dryer, which uses heat to dry any wetness the sand retains after being washed. Some residents living around Pattison Sand’s proposed expansion at its site in Clayton County, Iowa, are concerned about being exposed to silica dust, which can cause lung damage if inhaled. 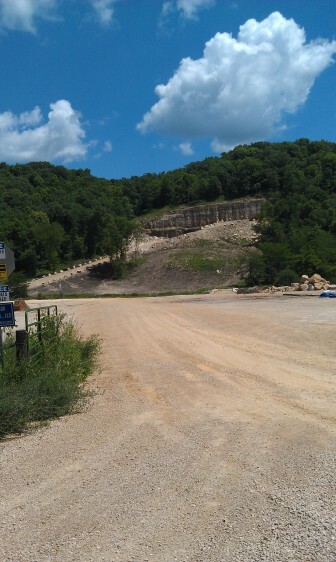 An entrance on the west end of a Pattison Sand Company mine in rural Clayton County, Iowa, near the small town of Clayton, on June 24, 2014. Tim Adkins, who joined Pattison Sand 14 months ago as its health and safety director, said after the April 28 meeting that claiming Pattison Sand’s record is the worst in the industry is a “terrible, terrible, misconception” and an “out-of-context statement to make.” He attributed some of the past violations to lack of experience by the Pattison family, who used to store and ship grain from the underground caverns that are now mined. “When they (Pattison Sand) went into the mining industry, they didn’t know about the mining industry. They’d never dealt with MSHA. They didn’t know MSHA regulations,” said Adkins, who has over 40 years of experience as a health and safety professional, including over 35 years in mining. Adkins added that underground mines such as Pattison Sand’s generate more violations because they are inspected twice as often as surface mines, four times a year versus two. But even when compared to other similar underground mines, Pattison’s track record is not stellar. 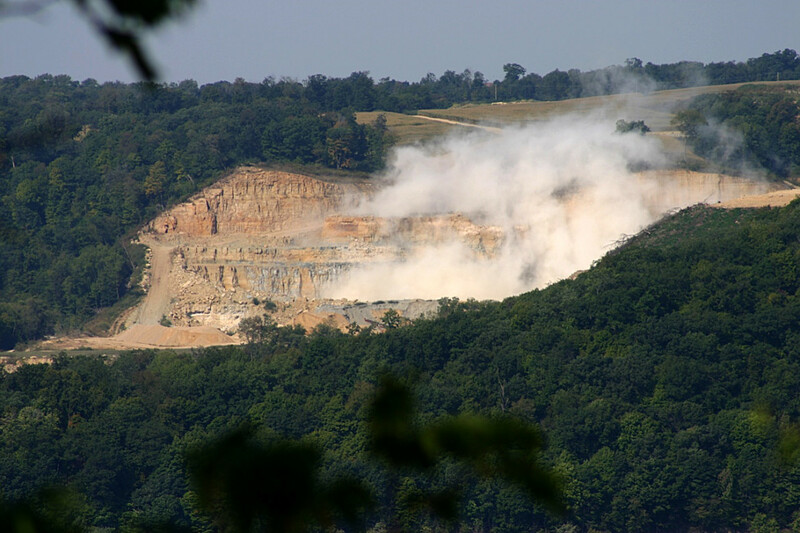 In 2010, 2011 and 2014, the company’s Iowa mine had above-average rates among underground metal and nonmetal mines of violations that are deemed “significant and substantial” by MSHA. Data prior to 2010 were not available. Adkins said Pattison Sand works very closely with MSHA to ensure compliance. That was not always the case. In 2011, Pattison Sand sued the agency after it shut down the majority of the underground mine following multiple roof collapses, including one in which at least 30 tons of rock fell onto an excavator; the miner operating it was unhurt. The lawsuit and appeals kept the underground part of the mine closed for several months. Besides Pattison’s Iowa mine, MSHA lists only two other underground industrial sand mines in the country. 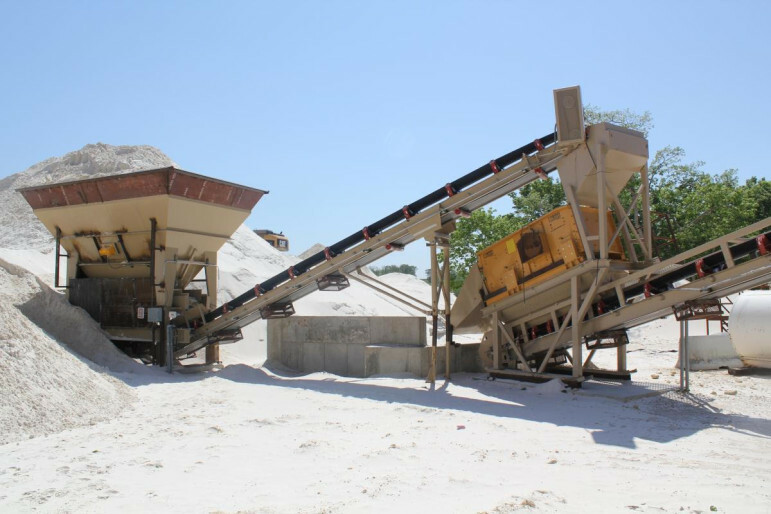 Both are located in Pierce County, Wisconsin, and operated by the Wisconsin Industrial Sand Co. Since 2005, one of the mines has received 279 violations — a fraction of the number racked up by Pattison. The other, operating only since 2008, has received 127 violations. 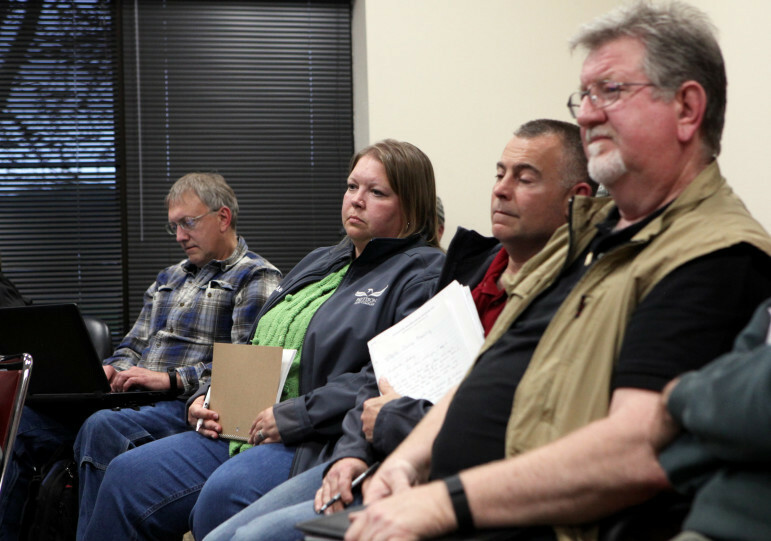 At the April 28 meeting in Elkader, 37 people submitted comments raising questions about Pattison Sand’s record of MSHA violations, burning at the company’s Iowa site, concerns about workers’ respiratory problems, conflicting results of air quality studies and dust. 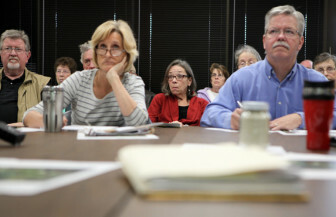 Kathy Kachel (center), a Wisconsin homeowner whose house overlooks Pattison Sand’s Iowa operations, reacts to testimony given by professor Patrick O’Shaughnessy at a meeting of the Mine Reserve Expansion Study Committee. In the foreground are commitee members Anne Osmundson and Tom Blake. Kathy Kachel, who attended the meeting, blames Pattison Sand’s Iowa mine for the white sand she dusts inside her house. She lives in Bagley and can see the facility from her porch. Kachel would like to see it shut down. In Wisconsin, Pattison Sand operates a surface mine in Bridgeport, about a 30-minute drive northeast of its Iowa site. Four Bridgeport residents and the Crawford Stewardship Project, an environmental group that promotes sustainability and local control of natural resources, tried unsuccessfully to block that mine. The status is currently listed as “intermittent” based on the number of hours worked at the site. Since it began operating in August 2013, the Bridgeport mine has received seven violations for which the company paid $824 in fines. Those violations include failing to notify MSHA before starting operations, neglecting to prepare a material safety data sheet for each hazardous chemical the mine uses or produces, failing to provide first aid materials, and failing to provide safe means of access to travelways. Garcia-Rivera said violations at mines that are not yet fully operational, such as Pattison Sand’s Bridgeport site, are to be expected. MSHA is only required to inspect such intermittent surface mines once a year. The mine expansion committee plans to meet again on Wednesday.